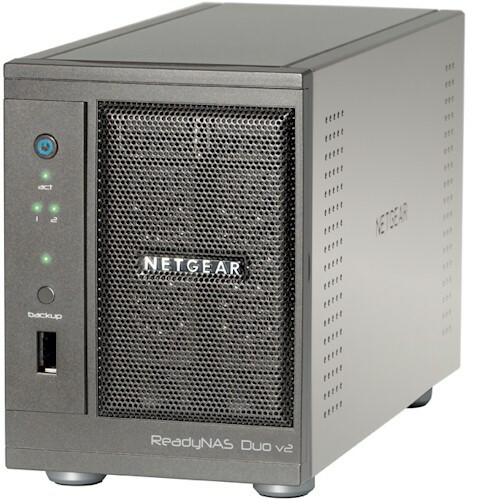 About four years ago, I was given the opportunity to review NETGEAR's ReadyNAS Duo. Since that time, I've been using it to store data, backup our computers and save our family pictures and videos. NETGEAR revised both the Duo and its four-bay entry-level sibling, the NV+, about a year ago, but had been reluctant to submit them for retest. We finally were able to convince them that SNB readers were as interested in NETGEAR NASes as any others. So here I am with the v2 review. The Duo v2 is physically the same as the Duo v1. It measures 3.98”W x 5.59”H x 8.66”D and weighs 4.56 lbs. without hard disks. The power connector is in the back, which connects to an external power brick, similar in size to one that might power a laptop computer. As I mentioned in my review of the Duo v1, I like the construction quality of the Duo. It has a hinged front door with an air filter covering the disk trays that is magnetized to ensure secure closure. I also find the drive bays on both the v1 and v2 to work quite well. The v2 drive bays have the same solid feel as the v1 drive bays that click securely to the chassis when inserted. There are power and backup buttons on the front, along with a USB 2.0 port. There are indicator lights for activity, disk status, and backup status, shown below. The back of the Duo v2 has two USB 3.0 ports, a 10/100/1000 Ethernet port and a Kensington Lock security port. Note the addition of the USB 3.0 ports on the Duo v2 as opposed to the USB 2.0 ports on the Duo v1. In terms of quantity, the number of ports on both the v1 and v2 are the same, although the layout in the rear is slightly changed on the v2. The picture below shows the internal chassis of the v2, viewed from the left rear corner. The v2 has a larger 80mm fan that is software controlled. A larger fan can run slower to move as much air as a smaller fan and slower means quieter. To my ear, the Duo v2 is significantly quieter than the Duo v1, likely due to the speed and size of the fans. The status display on the v2 reports its 80mm cooling fan running at 750 RPM, while the status display on the v1 reports its 60mm cooling fan running at 2400 RPM. The photo below presents a stark contrast between the v2 (left) and v1 (right) fans. Below is a shot of the Duo v2's main board. The big difference between the v1 and v2 is the switch to a 1.6 GHz Marvell 88F6282 Kirkwood ARM processor from the custom Infrant processor used in the v1. Both the v1 and v2 have 256 MB of SDRAM, but the Duo v2 uses faster DD3 SO-DIMM. You can see other components for both the original and v2 Duo in Table 1 below.